Our next nominee for the August edition of the Spread Your Warmth campaign is the Crusade for Children. They were established in 1954 by WHAS-TV in Louisville, Kentucky to help raise money for agencies, schools and hospitals to better the lives of special needs children. The money that the Crusade for Children raises is distributed by an independent board of interdenominational ministers known as the Crusade Advisory Panel. Representatives from the beneficiary agencies, schools and hospitals apply for grants and appear before the panel during grant hearings held each spring. 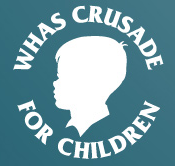 Every year on the first full weekend in June WHAS Radio (AM 840) and WHAS-TV (Channel 11.1) and worldwide on WHAS11.com holds an annual Crusade radio/telethon. Portions of this broadcast are also seen and heard on a Kentucky statewide network. Through their efforts millions of children have been helped through the various agencies, schools and hospitals that benefit from their philanthropy. Thank you to Patricia Skinner for nominating the Crusade for Children for the August edition of Sweatshirt Blanket’s Spread Your Warmth campaign. If you would like to learn more about this great cause visit their website. Crusade for Children definitely has my vote! Crusade for Children has my vote! Great cause. I vote for Crusade for Children! I vote for Crusade for Children…is this how I vote? No, you need to use the poll on the top right of any page. Select the organization you wish to vote for and then click “vote”. You can vote once per day.